The flames of religious radicalism continue to fan out across much of the Muslim world in general, and the Palestinian Territories in particular. Islam as a religion remains a spiritual center and focal point in the lives of Palestinians, and actively molds and shapes the content and vision of Palestinian society. In contradiction to Islamic traditions of sparing prisoners and the wounded, violent events took place recently in Gaza and the West Bank in which Muslims from Hamas had no reservations about dragging other Muslims from Fatah into the street, beating them up and then summarily executing them. Images of Palestinians holding guns pointed at one another and shooting at each other are seen across the global airwaves. According to Mohammed Dajani, director of American Studies Institute at Al-Quds University in Jerusalem, this reflects the present kindergarten jihadist education which many young Palestinians receive; namely, a simplistic concept of jihad which encourages the bloody encounters which have resulted in the recent deaths of more than 200 Palestinians. 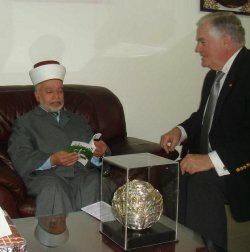 According to Professor Dajani, the roots of the problem lie in the fact that Palestinian youth are growing up learning two lessons: that the only way to resolve conflict or differences is through a win-lose formula; and that Muslims, Christians and Jews are not meant to coexist, let alone thrive together. Dajani, founder of the Wasatia Movement in Palestine, is working from a small office in one of the poorest neighborhoods in a suburb of Jerusalem to do something about this distortion of Islam. "Wasatia" embodies centrism, moderation, justice, balance, and fairness. The term comes from the Arabic word "wasat" meaning "middle of the road" or "center of the circle." It is a balance of extremes — between rich and poor, high and low, empty and full, courage and cowardice. Its English equivalent is "moderation" and its meaning in the Qur'an is justice and goodness. Above all, the concept of wasatia emphasizes the avoidance of extremes, and the rejection of radicalism — a lesson also taught by Christianity and Judaism. Dajani further argues that the liberal democratic values of equity, tolerance, justice, liberty, pluralism, the rule of law, and respect for civil and human rights all have comparable values in Islam, and he cites surahs from the Holy Quran to support this view. His vision is a mix of the secular with religion, a vision which speaks to the issues of peace, co-existence, and tolerance from within the Islamic tradition. Professor Dajani maintains that wasatia reflects the peaceful message of Islam, stating: "The gap is and has always been very wide between the song and the singer; while Islam is a religious ideology that deals with faith and calls for peace, free choice, dialogue and coexistence, the Muslim fundamentalist ideology demands the use of violence, terrorism and war to be waged against those perceived to be the 'other' — meaning Christians and Jews or anyone classified as infidels." Dajani's goal is to popularize the neglected concept of moderation and peaceful coexistence among young Palestinians and to acquaint them with the heavenly call for wasatia. He is trying to meet the challenge of religious radicalism through a real-time, homegrown contest for the hearts and minds of ordinary Muslims. The wasatia movement is reaching out to a wide range of sectors within Palestinian society including religious leaders, prisoners and ex-prisoners, women, youth, university and high school faculty and students. Wasatia structures its educational programs around themes such as state-building, political and social reform, peace education, women's empowerment, religious moderation, economic development and support for civil society. Perhaps the deadly outcome of recent events will serve as a tragic sign of the need for wasatia to become a touchstone of the Palestinian landscape. Wasatia adheres to a moral platform that places justice, rights, and peace at top of its priorities. Dajani maintains that both sides in have been wronged and deserve mutual recognition, legitimization and accommodation. He believes that creativity and imagination play a key role in bringing both conflicting parties to the table to move ahead toward forgiveness and reconciliation. He calls for a negotiated settlement and rejects violence and terrorism. His position is based on the premise that out of the ashes of decades of conflict, pain and suffering, a mutually-accepted win-win compromise will emerge. Notably, wasatia recognizes the moral legitimacy for the existence of both the State of Palestine and the State of Israel. On the two controversial issues of refugees and Jerusalem, Dajani proposes rational solutions. With regard to refugees, Wasatia makes a distinction between the "rights of refugees" and the "right of return." While it considers the "rights of refugees" sacred, it views the "right of return" as an issue to be negotiated with Israel in the final settlement negotiations. As for Jerusalem, Dajani contends: "Actually the Ottomans have solved this problem for us. The main holy sites of Moslems, Christians, and Jews are located within the walls of the Old City, which is divided into four quarters: Christian, Moslem, Jewish, and Armenian. Jerusalem would be declared an open city and each religion would take control of its quarter."